Kaskade | Do You Hear The Music? Deep in the heart of Texas……in case you missed it at 12 a.m. CST/10 p.m. this morning/last night, Austin City Limits dropped their 2013 lineup. Expanding to two weekends this fall, October 4-6 and 11-13, Festival goers should have plenty of debating of who to see when the schedule comes out. The lineup: The Cure, Depeche Mode, Thom Yorke’s Atoms For Peace, Kings of Leon, Muse, Phoenix, Wilco, Lionel Richie, Kaskade, The National, Queens of the Stone Age, Vampire Weekend, Arctic Monkeys, Kendrick Lamar, D’Angelo, Passion Pit, Franz Ferdinand, Tame Impala, Local Natives, Portugal. the Man, Neko Case, Grimes, Jimmy Eat World, Dawes, The Joy Formidable, Purity Ring, Divine Fits, Toro Y Moi, The Shouting Matches, Haim, Smith Westerns, Savages, FIDLAR, Parquet Courts, Autre Ne Veut, Phosphorescent, Wild Belle, Hundred Waters, Silversun Pickups, Grouplove, The Black Angels, Okkervil River, Shuggie Otis, Wild Nothing, Pinback, Foxygen, Reignwolf, Deap Vally, Bright Light Social Hour, Lissie, Jon Spencer Blues Explosion, Thao and the Get Down Stay Down, White Denim, The True Believers, Mona, Roadkill Ghost Choir, JC Brooks and the Uptown Sound, Typhoon, The Blind Boys of Alabama, Dan Croll, Shovels & Rope, Electric Guest, Valerie June, The Band of Heathens, Red Baraat, Jacuzzi Boys, Widowspeak. 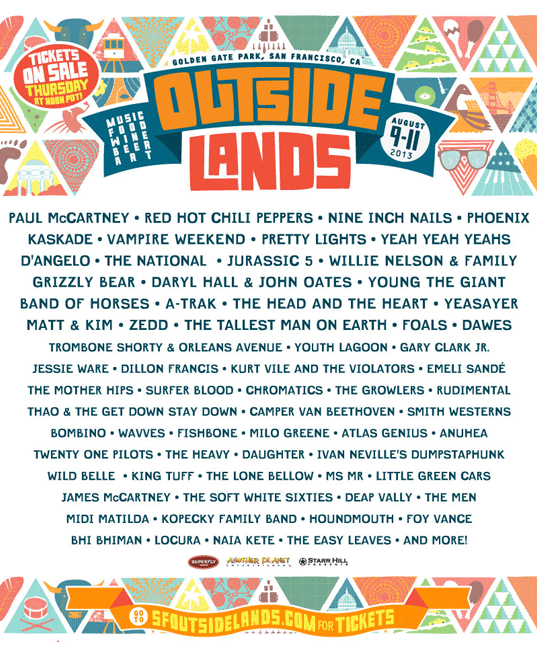 2013 OUTSIDE LANDS Lineup is HERE!! Check out the stacked lineup for 2013 Outside Lands, August 9-11 at Golden Gate Park. C’mon Paul McCartney, Nine Inch Nails, Red Hot Chili Peppers, Phoenix, Vampire Weekend, Kaskade, Jurassic 5, Yeah Yeah Yeahs, The National, Pretty Lights, D’Angelo, The Head and The Heart and a whole lot more! So here we are, one week away from Lollapalooza and the excitement is building. So many great bands and musicians over three wild and crazy filled days in Chicago! As Grant Park gets ready to be invaded by 100,000 people, I’m running down a small little guide if you find yourself attending and for those who plan to watch the YouTube stream. Let’s get it out of the way, headliners. Night One: pits Black Sabbath vs. The Black Keys – only US date for Black Sabbath, Night Two: Avicii vs. Red Hot Chili Peppers – RHCP dominated Bonnaroo with a fiery set, Night Three: Justice vs. Jack White – what I’m most interested in is how the crowd sways, when Childish Gambino and Kaskade play at the same time. Some afternoon delights for you. Bands like First Aid Kit, The Growlers, Michael Kiwanuka, The War On Drugs, Milo Greene, JC Brooks & The Uptown Sound, Kopecky Family Band, Chancellor Warhol, Moon Taxi, GIVERS, Bombay Bicycle Club, Outasight, Hey Rosetta!, Oberhofer and more pull early time slots but I promise will be worth arriving for. These bands are awesome and this is some new music you should really be checking out. Time Conflicts. A tip of the hat to the schedulers for finding the easiest way to pull a crowd a part as there are many times over the three days that will have festivalgoers torn. For instance, on Saturday at the same time you’ll have to decide between Alabama Shakes, The Temper Trap, The Dunwells, B.o.B and fun. Good luck! Who I’m excited for. Well I’ve been fortunate enough to see so many of these acts live before that I’m mostly craving the opportunity to see many for the first time like Of Monsters and Men, The Gaslight Anthem, The Dunwells, Miike Snow, M83, The Weeknd, Twin Shadow, Amadou & Mariam, Dum Dum Girls, The Devil Makes Three, First Aid Kit, Milo Greene, DEV, Dry The River and Moon Taxi. Plus after finally seeing Alabama Shakes live at Bonnaroo, I can’t wait to see them again, simply amazing live. 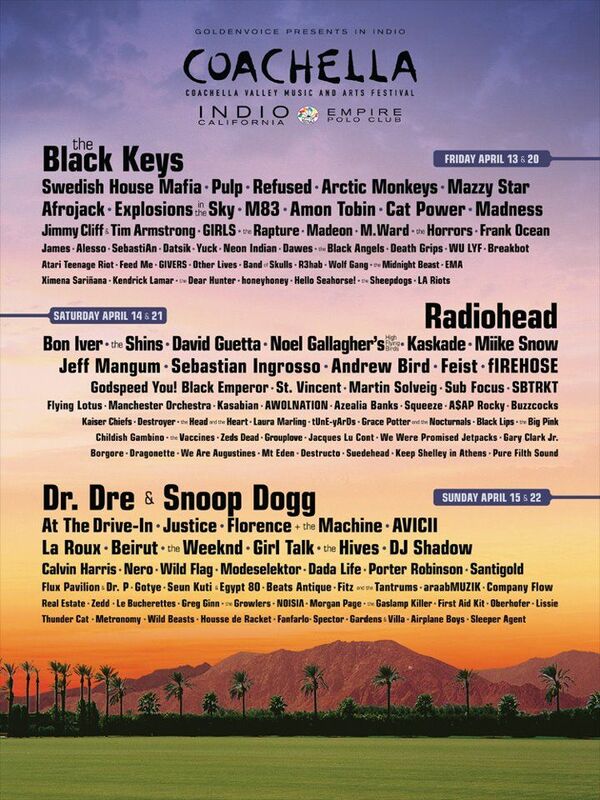 Another year of anticipation has come and gone as the 2012 Coachella line-up was released and while it’s pretty awesome they secured all the acts for back-to-back weekends on April 13-15 and April 20-22 I have to say my initial reaction was meh. Don’t get me wrong, there are a ton of phenomenal musicians slated to play the festival but I personally feel they lacked in the bigger acts category but did a stellar job with the smaller ones. Headliners: Radiohead, great score and definitely one of the most sought after acts this year, The Black Keys love ‘em but bumping them up one slot from last year into the headline act…., Dre and Snoop, ok I get it and Cali kids will probably love this but is this how you really want to close out three days of music (I’ll probably be eating my words as this may end up being the most talked about performance)? Also this year has so much more EDM and on the main stages, I know its music of the present but I wonder if/how it will influence and change the dynamic of the festival since it’s thrust to the top. I’m a big fan of EDM and these artists but Swedish House Mafia, David Guetta, Avicii, Kaskade, Afrojack, Justice, Sebastian Ingrosso and Madeon all as “main acts” it could get interesting just look at how many other EDM acts are booked. Something else that I love and hope is a trend for all the festivals this year is the addition of acts from outside the United States. Bands like WU LYF, Wolf Gang, M83, The Vaccines, The Hives and others that are extremely talented will get introduced to so many new fans. All in will it be fun, heck yeah but what else will be fun is Coachella East aka Las Vegas. With a week in between you better believe Las Vegas is going to be a mid-week retreat with acts popping up for DJ sets in clubs and concerts peppered all over the Las Vegas Strip. In case you missed it while feasting on turkey, stuffing and pumpkin pie over Thanksgiving, Lupe Fiasco dropped a new mixtape, Friend Of The People. Any Lupe fan will dig this mixtape and even non-fans should give it a shot as he lays down some powerful material over beats from the likes of Ellie Goulding & Bassnectar, Justice, Nero, Kaskade & Skrillex, John Coltrane, M83 and The Glitch Mob. 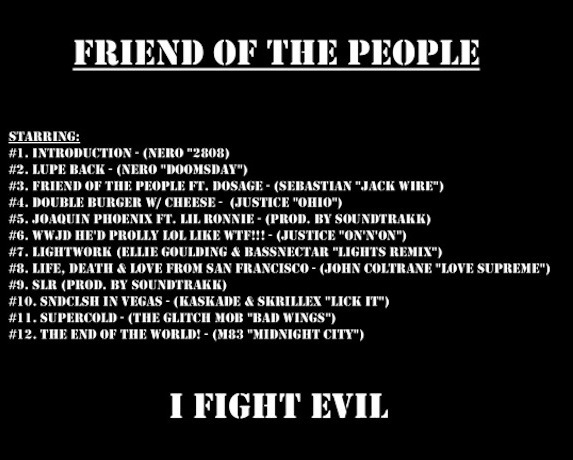 Thanks to the main man himself, you can download Friend Of The People HERE. And listen closely as he drops some audio from the UC Davis Occupy Wall Street protesters who were pepper sprayed. What a week for new music it is and that goes for all genres. Here are my picks for the discs to pick up/download asap. It’s been almost six years of living in Las Vegas and I don’t even know where to begin with the musical moments I’ve had a chance to enjoy while living in Sin City. My hope is that I have included a good amount of them below but given that my memory has slipped a bit since living here, I’m sure there will be plenty of “The Vegas Years” posts as I recall parties, concerts, performances, red carpets and the likes of. In the clubs, performances lent themselves to be everything from one song to a couple hours depending on the musician and where the night was going. I’ve worked and seen everyone from The Killers at PURE and Jay-Z at TAO to the Black Crowes at Studio 54 and New Kids on the Block at LAX (this might have been the most insane crowd I’ve ever seen at a club). Dare I even say we had an event at PURE for Paris Hilton’s CD release party and at LAX Heidi Montag debuted her first single during her 21st birthday but I was also part of far better events that included Christina Aguilera, Diddy, Ludacris, Britney Spears, Usher, Ne-Yo, Mariah Carey and Nick Cannon, Gavin Rossdale, Robert Randolph & The Family Band, Lil’ Jon, LMFAO, Big Boi, Flo Rida, Korn, Switchfoot, Fat Joe, R. Kelly, Jessica and Ashlee Simpson, Timbaland, Panic! At the Disco, Puddle of Mudd, Busta Rhymes, Fall Out Boy, Dave Navarro, Wyclef Jean, Travis Barker, Fabolous, Too Short, Korn, 30 Seconds to Mars, Vanilla Ice (was hysterical), The Game, Rick Ross, Juliette Lewis and The Licks, Kid Cudi and Asher Roth, John Legend, Coolio, Doug E. Fresh, Ray J, DMX, The Sugar Hill Gang, Naughty by Nature, Crazy Town and of course the Pussycat Dolls (since we had their lounge at PURE). The list goes on and on but so many memories and what an unbelievable feeling to look back on. I was also spoiled with the best DJs in the world on a nightly basis. When DJ AM signed a residency with PURE it was like musical euphoria when he was spinning and for a few years you couldn’t ask for anything better until LAX opened at it became unfathomable to be able to listen to DJ AM and DJ Vice on a weekly basis. Two people who I consider the best club DJs and can make a party rock but more importantly, genuine human beings. Add in that Vegas is a mecca for international renowned DJs and so it became a regular occurrence to bounce around from club to club and pool to pool to hear the very best (and still happens J); from Oakenfold to Paul Van Dyk and Ferry Corsten to Erick Morillo, Tiesto, Steve Angello, Robbie Rivera, Carl Cox, Donald Glaude, Chris Cox, Laidback Luke, Deep Dish, Roger Sanchez, Fedde Le Grand, Sander Kleinenberg, Deadmau5, Kaskade, John Creamer & Stephane K, Dave Aude, Ivano Bellini, Oscar G, Bob Sinclar, Markus Schulz, Victor Calderone, Afrojack, Chuckie, Nathan Scott & Tony Arzadon and so on it is truly incredible the music that descended upon the desert of Las Vegas. Spoiled is an understatement. As I mentioned, one benefit of working with nightclubs was the fact that I had the opportunity to not only facilitate many of these events but being a music lover, see many acts that I wouldn’t have in concert. Here are some of my favorite nights of music in Vegas clubland. 1) DJ AM and Travis Barker first time at LAX Nightclub: The way LAX was built and with the stage setup in the middle of the dance floor it felt like you were in the round as a packed house of partiers were witness to 45 minutes of intense DJ/Drumming to old school and current tunes. You could see the genuine fun AM and Travis were having and while I had seen this collaboration before at PURE, there was something magical about the performance at LAX. 2) The Killers at PURE Nightclub: We had this thing called the Summer Surprise Series with different music acts popping up on Industry Tuesday nights and really the cat was let out of the bag days in advance but to kick off the 2008 series, this performance was kept pretty much under wraps until about the day of (which is an eternity in Vegas and quite frankly shocking when you consider the nature of people to keep it quiet). With a packed house on hand, The Killers took a break from recording their album down the road at the Palms and delivered a two song performance, their first in a nightclub and very fitting as they are Vegas boys. A club version of Mr. Brightside and a cover of Cyndi Lauper’s “Girls Just Want to Have Fun” were the tracks of choice for the evening. 3) When we opened LAX Nightclub, Bob Sinclar was one of the hottest house music DJs in the world and we had him spin and Gary Pine who is the vocals on many Sinclar tracks (World Hold On, Love Generation) on-hand to sing to track. At LAX the DJ booth has a loft above for live performances and sure enough you had Sinclar spinning with Gary Pine above belting out the vocals – truly a crazy fun night of work. 4) 2007 MTV Video Music Awards Weekend was probably one of the craziest times to work in a nightclub in Vegas. Coming off of a week straight of MAGIC parties and then the grand opening weekend of LAX Nightclub with Britney Spears, MTV Video Music Awards made it 14 straight days of parties let alone having four nightclubs to look after (luckily I had a great team working with me). With LAX brand new, the first night was hosted by Fall Out Boy, Panic! At The Disco, Gym Class Heroes and Cobra Starship and on a personal note that night ruled because Mark Ronson made an appearance and I think he is one of the most gifted musicians in the world. The second night Christina Aguilera hosted a big bash (it was the event where Paris Hilton outted her pregnancy) and the third night at LAX was hosted by Diddy and DJ AM which was complete insanity after Diddy announced on-air at the Awards his after party at the club. I practically lived at Luxor that weekend and bounced over to PURE at Caesars Palace where Diddy hosted an event one night and Nicole Scherzinger of the Pussycat Dolls hosted the next.